It is one of our major goals to provide companies with communication solutions that make equally good use of classic brand management strategies as of the instruments of digital communication. For the definition of brand values and the brand positioning derived from those definitions, we employ a psychological advertising model that has been developed by planning specialist Dr. Benjamin Schwenn. With the help of this model, we can identify three closely interwoven levels: identity, relevance and difference. At the intersection of the three levels, the brand core is located – which serves as the basis for defining the positioning of a brand. Identity describes the brand personality in a narrower sense: the internal and external consistency. Relevance means the functional and/or emotional identification potential for the target group(s). Difference indicates the brand’s originality and distinctness in comparison to competitors. 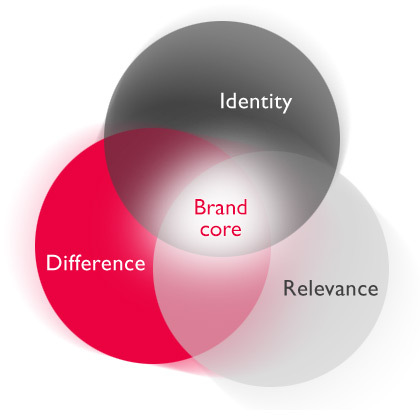 Brand core defines the essence, the DNA of the brand. It lies at the intersection of the three dimensions.